DEM L71 is a supernova remnant (α=05h 05.7m, δ=-67° 53′ J2000) located about 160,000 light-years away in the Large Magellanic Cloud, a close neighbouring galaxy in the far southern constellation of Dorado (the swordfish). 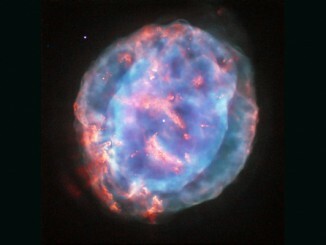 This image captured with the NASA/ESA Hubble Space Telescope is just 2.68 x 2.0 arcminutes wide. Click the picture for a larger-scale version. Image credit: ESA/Hubble & NASA, Y. Chu. Several thousand years ago, a star some 160,000 light-years away from us exploded, scattering stellar shrapnel across the sky. 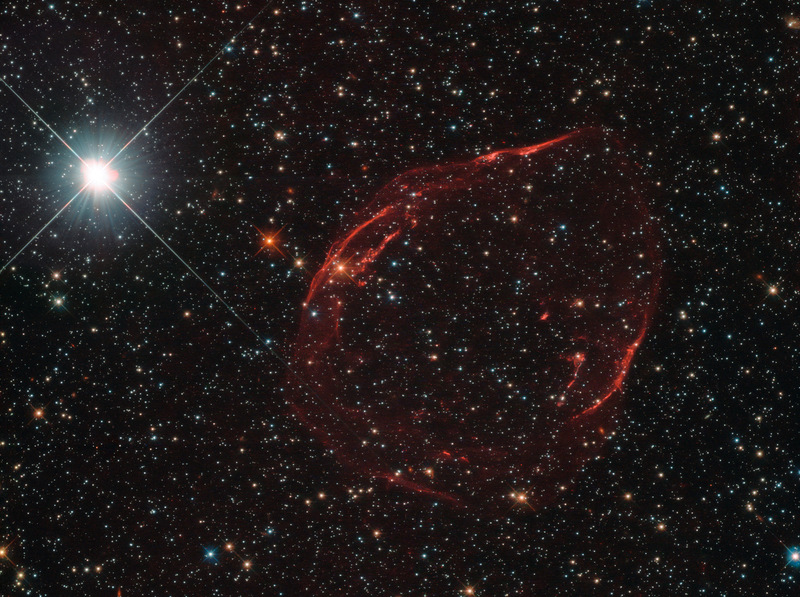 The aftermath of this energetic detonation is shown here in this striking image from the NASA/ESA Hubble Space Telescope’s Wide Field Camera 3 (WFC3). The exploding star was a white dwarf located in the Large Magellanic Cloud (LMC), one of our nearest neighbouring galaxies. Around 97 percent of stars within the Milky Way that are between a tenth and eight times the mass of the Sun are expected to end up as white dwarfs. These stars can face a number of different fates, one of which is to explode as supernovae, some of the brightest events ever observed in the universe. 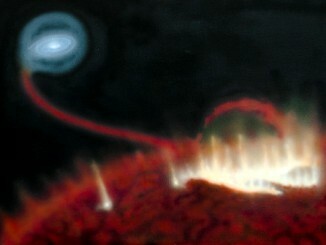 If a white dwarf is part of a binary star system, it can siphon material from a close companion. 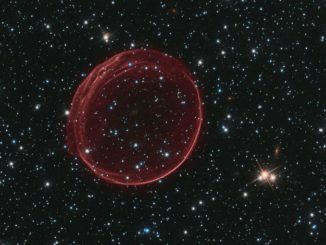 After gobbling up more than it can handle — and swelling to approximately one and a half times the size of the Sun — the star becomes unstable and ignites as a Type Ia supernova. This colourful bubble is a planetary nebula called NGC 6818, also known as the Little Gem Nebula, discovered by William Herschel in 1787. It is located in the constellation of Sagittarius, roughly 6,000 light-years away from us. The rich glow of the cloud is just over half a light-year across.